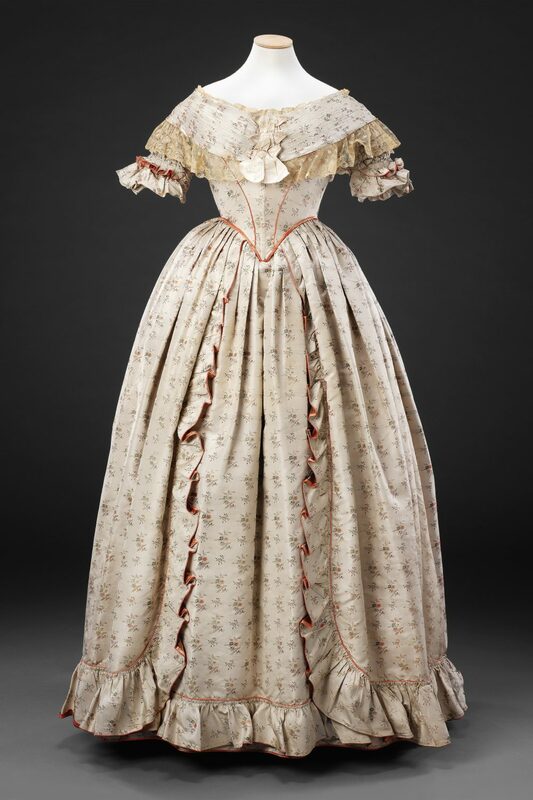 The John Bright Collection owns a number of 19th Century dresses that demonstrate the ingenuity of their designers and makers in producing versatile garments. 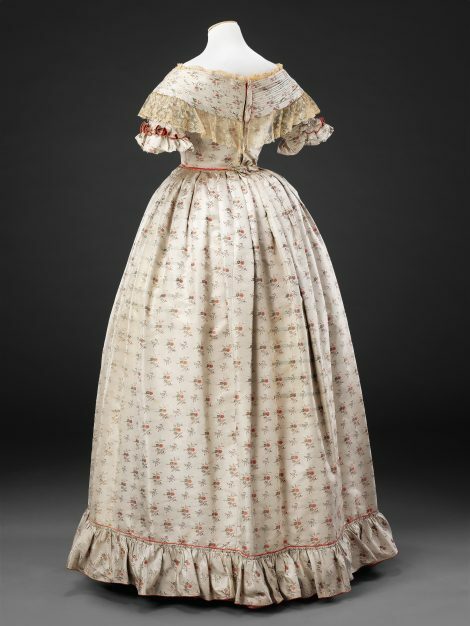 In a period when dresses frequently, though not invariably, comprised separate matching bodices and skirts, two bodices, one long sleeved and high necked for day, the other short sleeved and low necked for evening, were often made to be worn with the same skirt; this was particularly useful for women who travelled. 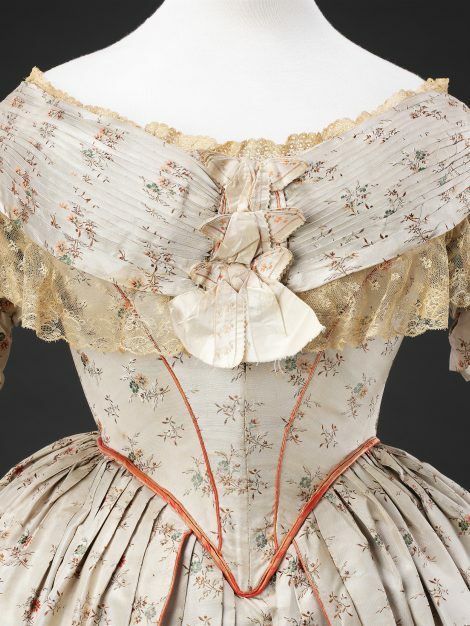 Alternatively, as a bodice fell out of fashion a replacement could be made to update the dress if leftover fabric had been kept. (See Related Images). 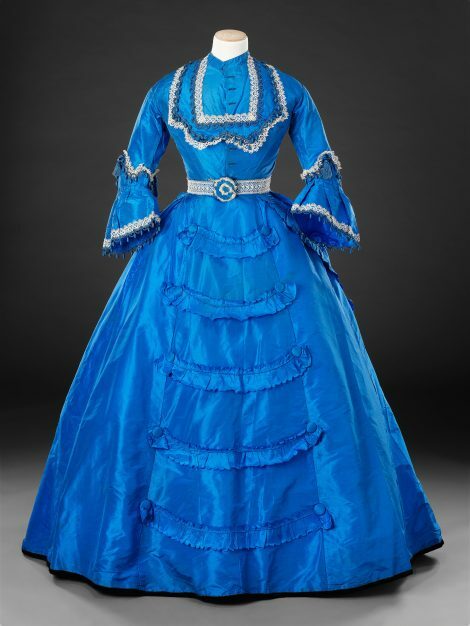 In this case, a short sleeved evening gown has separate additional long full sleeves to be attached to the base of the existing sleeves, transforming it into a formal day or dinner dress as can be seen in Additional Images. 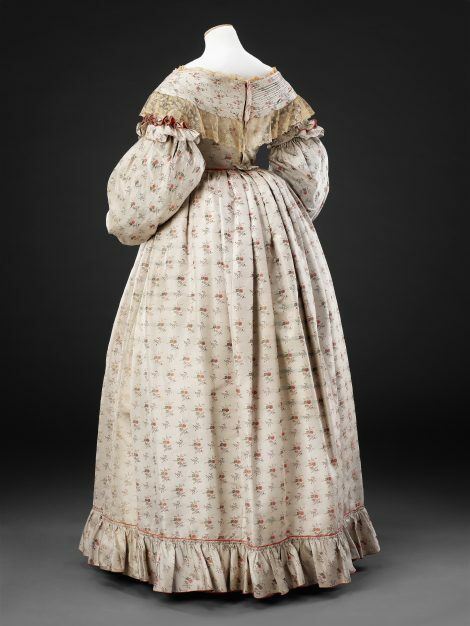 This was successfully achievable as the fashion of the day dictated a stylistic break between a close fitting upper sleeve and a full puffed lower sleeve. 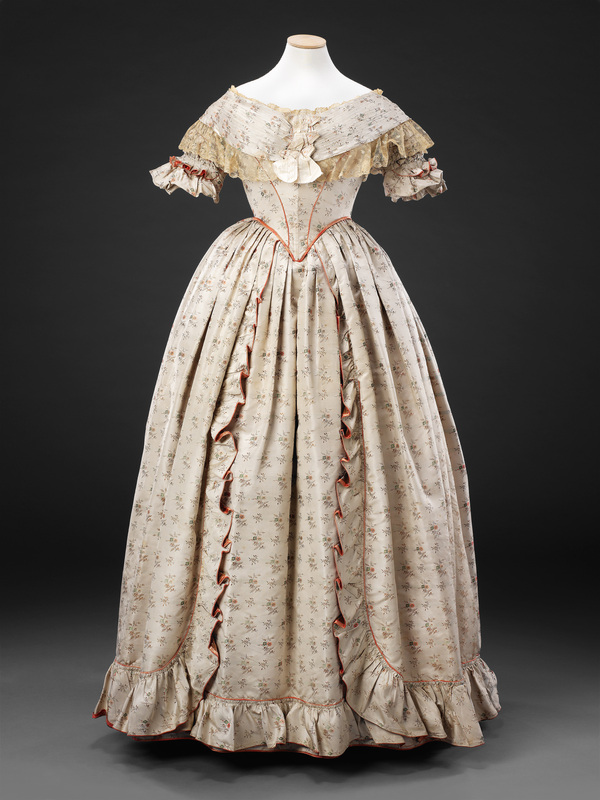 For day wear, a chemisette was necessary to cover the area exposed by the low neck. Economy would not have been a factor in this ‘two for the price of one’ design. 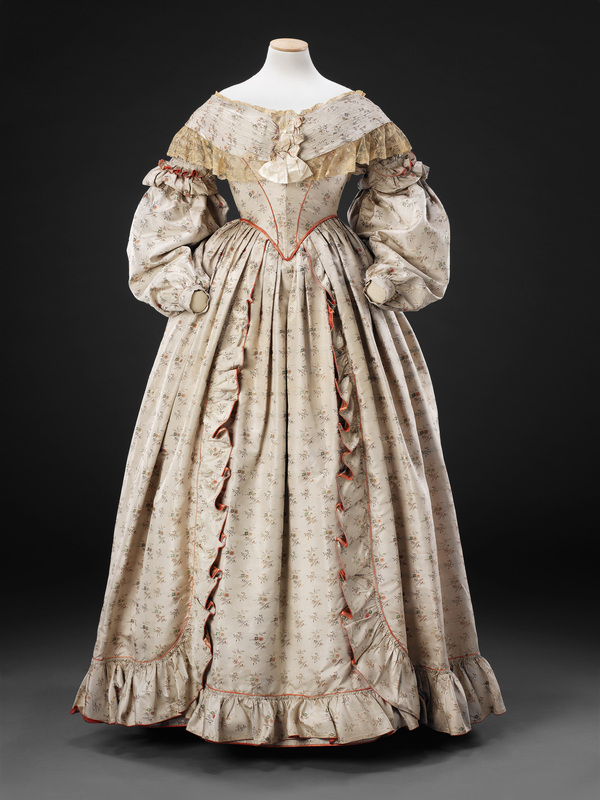 No expense appears to have been spared in the silk woven with flower sprigs, nor in the quality of the construction and the highly detailed trimming. 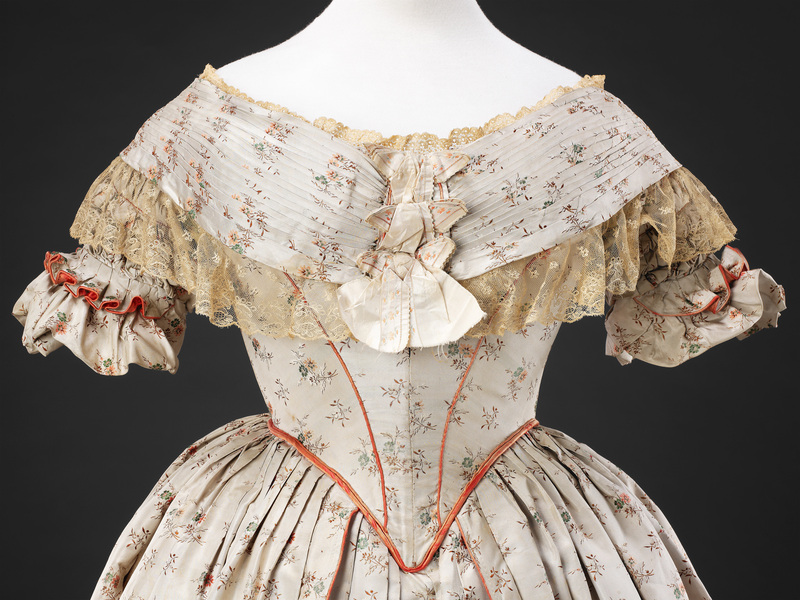 The wide bertha collar is closely pleated and bordered with silk lace, and at its centre three butterfly shaped bows are each made from five layers of folded floral ribbon. The upper sleeves are ornately ruched and frilled, and all the seams are piped in pink, as are the flounces down each side of the front and around the hem of the skirt. 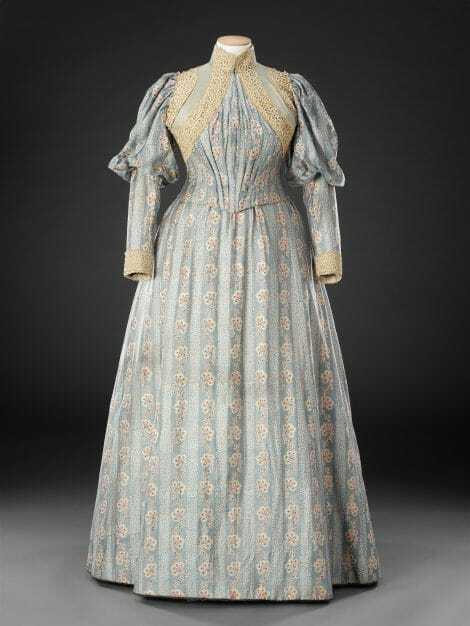 Garments from the John Bright Collection are used as reference by costume designers; this dress inspired a design by Susannah Buxton for Abigail Cruttenden as Blanche Ingram in the 1997 television production of ‘Jane Eyre’.